Why you need low volume plastic injection molding? In a fast-paced market, it is critical for a company to get new custom products into the market quickly, in most of the cases, it could be just a market-testing product with 10,000 units' volume or even less. But the plastic parts still need to be customized by injection molding to achieve the specified tolerance, finish, function. Traditionally, a hardened steel injection mold would requires a very high investment before you get a piece of sample, and it usually take 8-12 weeks to complete, which are unacceptable for a new product developing at the earliest phrase. We need a solution to reduce the cost of injection molding and shorten the lead-time of for companies to launch new custom plastic products. Low volume plastic injection molding is what you are looking for, which means low cost, quick turn around and on budget. How to do low volume plastic injection molding? Like the hardened steel mold production, low volume plastic injection molding requires a mold first, start with CAD design, and then CNC, EDM, wire cut, polish etc. all processing ways used by building a hardened steel mold are adopted to make a mold for low volume production. 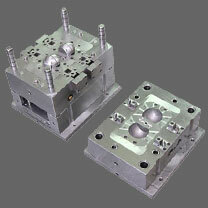 Low volume plastic injection mold sometimes refer to rapid tooling or prototype tooling. To achieve cost effective, the mold use lower grates steel or aluminum, which don't have to be withstand hundreds of thousands times of injection press as production mold. Molds made by pre-hardened steel or aluminum are capable of 10,000 to 100,000 molding cycles, this is enough for the needs of most of the low volume plastic injection molding. The manufacture process is shortened massively as the steel don't have to be hardened, the workability of soft steel is also better than hardened steel, which make the processing is easier and faster. Why choose low volume plastic injection molding? Low volume plastic injection molding save significant cost compare to harden steel production mold. Short lead-time, it takes only 2-3 weeks to get the custom plastic products. The plastic parts' quality of low volume injection molding is as good as the one from harden steel production mold. We have recently went to market with a unique golf tee, the trust tee. Now we are in the process of releasing another tee very similar in size and shape. We would like to manufacture very small volume of these new tees prior proceeding larger volumes. We are developing a new gaming product and need some custom button tops. Initially we only need a low volume 1,000 while we test the market and refine our designs. Eventually we hope it will lead to much larger volume, but for now we need a low cost mould and small volume. Please contact me using the email on our website.